To Sum It Up: Orphaned as a child by the wars that have plagued her homeland of Ravka for years, Alina Starkov is now a mapmaker in the army. Her life is nothing like that of the Grisha, who, with their powerful abilities, are an army of their own, led by the enigmatic Darkling. Alina never images being a part of the elite group, but everything changes when an army mission goes horribly wrong. Alina’s actions shock everyone, including herself, and draw the full attention of the Darkling. Alina is then taken to the royal court to be trained, and not only must she deal with the pressure of possibly being the only person who can save Ravka, but there’s also the separation from her childhood friend, Mal, who’s always been there for her. Review: January is not shaping up to be a good month for really, really popular YA books and me. I am now 0-for-2 in that department, with another greatly anticipated read pulling up short. 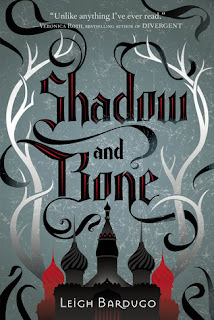 Shadow and Bone was on my to-buy list when it was first released to so many glowing reviews, and finally having read it . . . well, I’m glad that I borrowed it from the library instead. World-building is everything in fantasy, and I just wasn’t all that impressed with the world of Shadow and Bone. It seemed rather rudimentary, with everything revolving around the concepts of light and darkness. That in itself wasn’t an issue; the lack of depth to the clash between the two was. The novel also utilizes italics for a bit of Russian-inspired lingo, and again, this in itself was not a problem. Where it became distracting was in encountering words like kefta (the official garment of the Grisha) repeatedly. I think supplying context clues for kefta and other terms specific to the world would have been sufficient. I know I’m nitpicking over italics, but it was as though they were telling me I needed to pay special attention to these words long after their meaning became clear. I was also disappointed with the plot. It lacked the kind of drive that makes a book impossible for me to tear myself away from. The novel essentially follows the journey of humble orphan Alina as she learns that she’s not so ordinary after all. To me Shadow and Bone adheres to the standard Meek Girl Develops Amazing Power template, and it needed some variations on that theme to make it compelling. Alina has a very big self-esteem problem, and that was both very troubling and very frustrating. She’ll never be pretty enough for Mal, her friend since childhood, to see her as more than a friend. She’s not as pretty as the other female Grisha. Repeat self-confidence crushing thought pattern. Really, I wanted to shout, “THERE’S NOTHING WRONG WITH HOW YOU LOOK!” at her. Despite discovering that she possesses an incredible power that could be the salvation of her people, Alina never grows into the role of heroine. When she’s not hung up on her inferiority to everyone else, she’s pining for Mal. And I didn’t find Mal, who’s not particularly distinguishable from other YA love interests, pine-worthy. I admit to being a little intrigued by the mysterious Darkling (as one always is by guys who have titles for names) until I realized that there wasn’t much more to his character than shooting darkness out of his hands. He also ended up really creeping me out. I really wanted to love Shadow and Bone, and it had some promising ideas, but alas, the world, story, and characters didn’t cut it for me. Plenty of other readers have thought otherwise, however, so with this book, it’s probably me and not the book. All in All: Not really caring for this or Divergent back-to-back has me feeling rather stumped over exactly what it is that I’m looking for in a book at the moment. So I wouldn’t immediately cross Shadow and Bone off your TBR list; I just didn’t feel the love for it. Alina had such an inferiority complex, even after everyone was in awe of her power, and that made me grind my teeth. And I'll most likely not be continuing the series because this just wasn't my type of fantasy read. I seem to be on a bit of an unlucky streak with the YA books lately. I had the same thought, to change things up a little, so I borrowed a Dark-Hunter book from the library. I'm hoping that'll help break me out of my little reading funk.